Excellent results in treating Peptic ulcer. Ulcerations (sores) in the lining of upper part of the digestive tract are known as Peptic Ulcers. The ulcers may exist in the lower part of food pipe (oesophagus), in the stomach or in the initial part of the intestine (duodenum). About 10% of all adults are affected with Peptic ulcers at some time in their life. The incidence of Peptic ulcers is more common in males as compared to females. The pain is usually relieved by taking some food, milk, antacids, by belching or vomiting. Peptic ulcer disease is a constitutional disease that finds its local expression at the level of the digestive system. Being a constitutional disorder, it calls for constitutional approach towards treatment. Homeopathic approach towards the management of Peptic ulcer disease involves the evaluation of the complaint in details while taking into account individual factors such as one’s personal and family history while planning a long-term treatment. 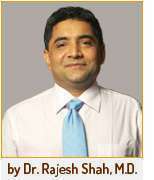 Since the treatment targets the root cause, Homeopathy offers long-term cure instead of temporary relief. It treats at a deeper level of immunity and enhances the healing capacity of the body. Homeopathy can also help to prevent complications of Peptic ulcers. 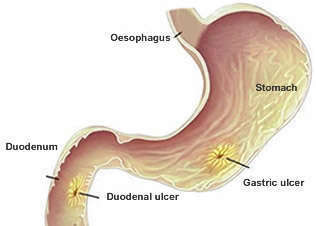 Peptic ulcer could be in the duodenum (Duodenal ulcer, DU) or in the the stomach (gastric ulcer). Based on the symptoms and by endoscopy we can diagnose the location of ulcer. The homeopathic medicines for peptic ulcer are many, one has to select based on the exact diagnosis and individual symptoms; including the personally type of the patient. Graphites: This homeopathic medicines sourced from the mineral is a powerful remedy for all kinds of ulcers in stomach, intestines, as well as on the skin. The patient may feel pain in stomach after about two hours of food, a sign of gastric ulcer, requiring Graphites. There may be dislike for sweets, sensitivity to cold air, dryness and roughness of skin, tendency to ulcer and scar formation, associated eczema or such skin disease, irregular menses in females; apart from the clinical symptoms belonging to the stomach ulcer. Phosphorus: A popular homeopathic medicine, very effective for diseases of esophagus, stomach, jejunum, intestines and colon, this medicine works very well when indications match. Burning pain in upper abdomen, sinking feeling, emptiness in stomach, losing weight in spite of eating well, sensitive to cold air, kind hearted personality, cares for others, friendly and talkativeness, etc. are some of the features indicating the need for Phosphorus.